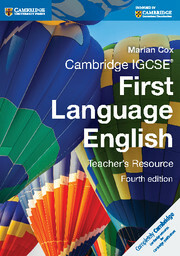 A suite of carefully crafted, skills-based resources providing full coverage of the Cambridge IGCSE First Language English syllabus for first examination in 2015 (0500 and 0522), or to support teaching any first language English GCSE. 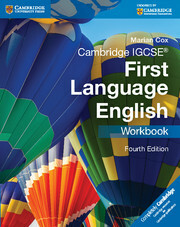 Written by a well-known Cambridge author and examiner, this updated fourth edition suite includes new activities and text extracts in every component. 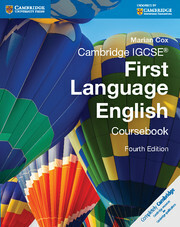 A full-colour, student-friendly Coursebook teaches key techniques and builds skills. A black and white write-in Workbook provides extra practice. A photocopiable Teacher's Resource Book containing further resources provides an independent solution to teaching. A dedicated microsite for Cambridge First Language English provides free online resources to support teachers, including answers to Coursebook activities. An interactive eBook of the Coursebook contains enhancements including audio of selected reading texts, interactive activities and progress tracker quizzes. An online teacher's resource pack provides a wide variety of interactive and printable resources for teachers, including support for assessment.